Danske Bank Ulster Schools’ All Stars launch at Malone House, Belfast. 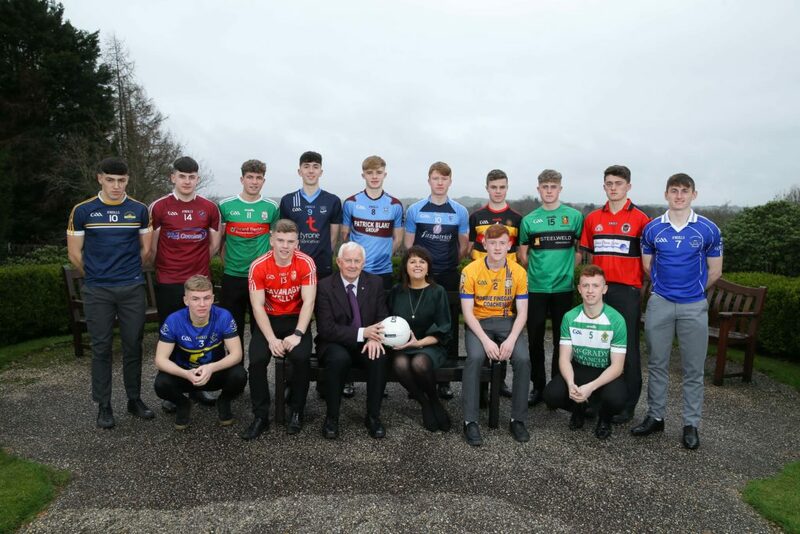 These All-stars are known as the 2018/19 Danske Bank Football All-stars and this is the 32nd year of the Ulster Schools’ All-star scheme. Players are selected over the course of two trial games, after being initially nominated by their own school to attend the trials. The scheme rewards excellence in skill and in sportsmanship and a player who has been sent off in any game between September 1st and the dates of the trials is ineligible for selection. 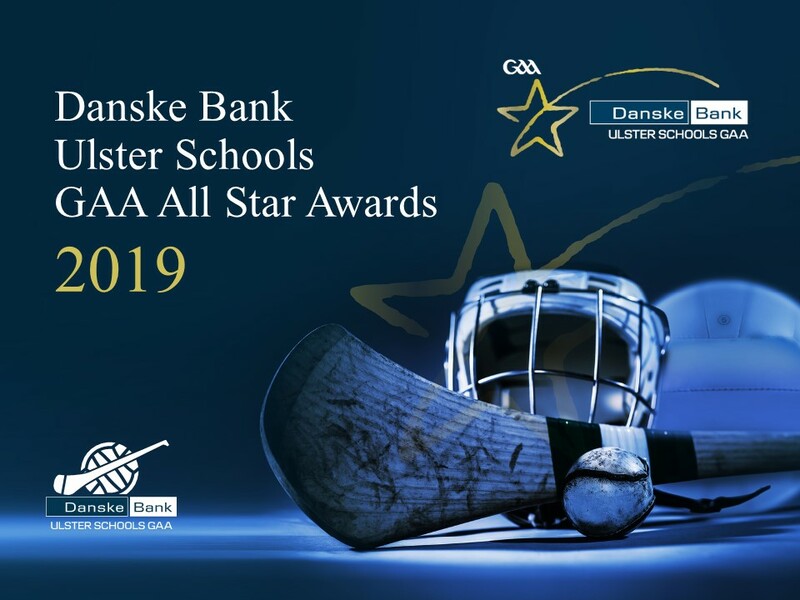 Three schools are winning their very first All-star awards – Matthew Murnaghan (Drumragh), Brendan McKey (St Malachy’s Castlewellan) and Ben McCarron (Lumen Christi). Six of the nine counties are represented in the team; Donegal, Antrim and Cavan miss out while there are six for Tyrone, two each for Down, Derry, Armagh and Monaghan and one for Fermanagh. The six Tyrone players all played in the 2017 team that won the inaugural under 17 Ulster and All-Ireland championship. Only eight of the team still have hopes of winning the MacRory Cup next March while three more are still in the MacLarnon Cup and a further two (Naoise Ó Mianáin and Joseph Oguz) are hoping to land the Markey Cup. In overall terms, there is no change in the top places of the leader-board for awards won over the past 31 years. St Patrick’s Maghera still ahead of Abbey CBS with 55 football awards over that period. Although Shea has represented his school in both the Danske Bank Rannafast Shield and Treanor Cup finals, he has not been fortunate enough to collect winners’ medals. However at club level he has been a little luckier and holds Armagh Under 16 league and Féile na nÓg medals. Shea plays a number of sports including hurling and soccer and is in much demand. Ronan has captained Patrician High to the Danske Bank Brock Cup and he also holds a medal for Corn Cholmchille. He has played for Monaghan through the age-groups and holds Ulster minor league and championship medals as well as a Gerry Reilly under 16 tournament souvenir, while at club level he captained Killanny to the Div 3 under 16 double and recently they won the Division 1 minor title. Naoise holds Danske Bank Ward and Corn Cúchulainn medals from his years playing for Lumen Christi in schools’ competitions and with Craigbane he has won a Derry under 16B championship. Paul is vice-captain of the school MacRory Cup team that knocked out last year’s finalists St Mary’s Magherafelt at the start of December. He has represented Armagh at under-age level through minors to the under 20 panel that reached the 2018 Ulster final. Paul has captained his club teams at different age levels and won an Armagh under 14 championship and minor league. Brendan is the first player from his school or club to earn an Ulster Schools’ All-star. With St Malachy’s he has won a Danske Bank Rafferty Cup and McDevitt Cup and is the current MacLarnon Cup captain. Brendan has also won a QUB Future Star award two years ago. He has represented Down at minor level and won under 14 and under 16 county championships with Dromara. Matthew is the first ever Ulster Schools’ All-star to come from the Integrated sector and was the captain of the Drumragh Colelge team that broke new ground by winning the 2016 JJ Reilly Cup. Matthew is an Ulster and All-Ireland medallist with the Tyrone under 17s from 2017, has played at under 20 level for Tyrone this season and a couple of weeks ago Micky Harte has brought him into the senior county panel. He has had a successful 2018 at club level, captaining the minors in their run to the county final and was in the Killyclogher senior team that also reached the final. As a result he was awarded the Teamtalkmag and O’Neill’s Young footballer of 2018. Patrick has played at all levels for St Colman’s and was a member of the Down under 17s that won the Ulster league title, while with Glenn he has won a South Down minor title. Brandon has captained his school at both Rannafast and MacRory Cup level and is in his third season with the MacRory team. He has represented Fermanagh at all under-age levels and was recently called into the county senior squad for 2019. Joseph has won medals for the Danske Bank Treanor, Rafferty and MacLarnon Cups during his time in St Ciaran’s and he is an Ulster and All-Ireland under 17 medallist with Tyrone from 2017. In the Errigal Ciaran colours he has won back to back Tyrone minor titles and was part of the senior team that recently won the county Division 1 league. Joseph takes his football from his mother Selena who has Tyrone and Ulster medals with her club. Ben is the first player from Lumen Christi to win a Danske Bank Schools’ All-star. He has helped Lumen Christi to the Danske Bank Ward and Cúchulainn Cup titles. He has won Ulster minor and under 20 titles with Derry and an under 16B championship with his club. For his under-age exploits with Derry, Ben was awarded an All-Ireland Eirgrid All-star. Michael was the inaugural winner of the Danske Bank Footballer of the month for his MacRory exploits with St Patrick’s Armagh during Octover, but Michael’s only Ulster schools’ medal came in the Danske Bank Brock Cup while he was a student in St Patrick’s Academy Dungannon. Another member of the successful Tyrone Ulster and All-Ireland under 17 team of 2017, Michael has won a Grade 2 championship with the Moy as well as two under 21 Tyrone titles. Robbie was in the school team that reached the Danske Bank MacLarnon Cup final two seasons ago, while with Monaghan minors he has won the Ulster league and championship double in 2018. He also has a Gerry Reilly Cup medal from earlier in his county career. With the Faughs he has won an Under 16 Div 1 championship and the Minor Div 2 double. Robbie is also an accomplished Basketball and Soccer player with his school. Ryan helped the Academy to the Danske Bank Brock Cup title and has played in both the Corn na nÓg and Rannafast Cup finals. He is another of the Tyrone Ulster and All-Ireland winning under 17 team of 2017. Ulster and All-Ireland winning Tyrone under 17s from 2017. He has recently been called into the county under 20 panel for the season ahead. He has captain the club in one of the two Tyrone under 16 finals and in 2018 helped the minors in their run to the county final. Tiarnán was part of the Holy Trinity team that won the Danske Bank MacLarnon Cup last March and then went on to win the All-Ireland Paddy Drummond Cup in Croke Park. Tiarnan also won the inaugural All-Ireland under 17 championship in Croke Park to add to the provincial success earlier in 2017. He has won Tyrone under 16, minor and senior championship medals with Na Fianna.